2018 wound up being a hell of a year. Besides how much politically and news-wise has been stuffed into the last twelve months, I also personally packed a lot in—getting married, having a wedding, welcoming my family to Japan to visit, going on honeymoon, living with my wife, and more. I’ve struggled to find time for gaming this year, as will be detailed a bit below, but I’m still very much caught up in the scene and enjoying what’s now available. If only used Nintendo Switch games weren’t holding their value here so damn well. Without further ado, let me introduce you to the games that earned spots on my Honorable Mentions list for 2018. 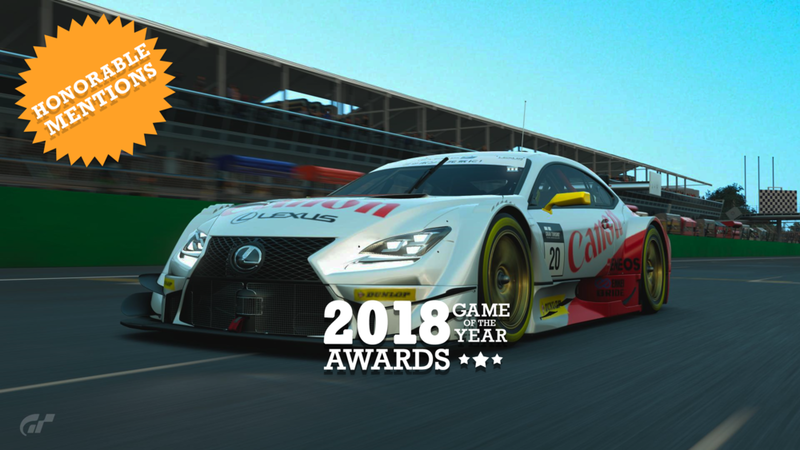 Although it didn’t make our 2017 top 10 list, we still gave Gran Turismo Sport, Polyphony Digital and Sony’s most-recent love letter to the automotive world, a category award. But 2017 was only the beginning of my adventure. In 2018 I continued racing online with fellow forum-goers all year long, and I kept coming back for the added and expanded single player content every month. The monthly updates included new cars, tracks, and single-player content—taking a formerly good-but-light game and moving it into heavyweight territory. New tracks mean more races in a given single-player series, or more options for the online hoppers; new cars mean those classes become fully featured (or are added, in the case of Group 2). It also continues to make racing much more accessible than other simulation-style games, which deserves applause. Praising FIFA 19 is as much about the game's overall quality as it is deriding Pro Evo Soccer. Essentially, I just want to keep running career mode and build a team that can annihilate the CPU. A proposition that's become incredibly stale in PES thanks to the lack of the FIFA license. The increasingly complicated methods to update a save file haven't helped, either. I might try to get into FIFA Ultimate Team, but most likely I’ll continue building an Arsenal squad to stand with the Invincibles and put Spurs in their place. Which is fine, and something FIFA 19 lets me do without effort. Small note: We hold our Game of the Year discussions in early December, and that means there’s always the risk that a great game misses the boat. Super Smash Bros. Ultimate would have definitely made our list had it released any other time of the year instead of right after our discussion. I'm confident about that not because it’s another Super Smash Bros. game, but because this is easily the best Smash has ever been. Smash Ultimate is a phenomenon that could finally get people to retire their 18-year-old GameCubes. It’s also the best Smash to pick up and play with friends. It sorta reminds me of how each successive Rock Band release smoothed down the edges and made having fun with pals easier and easier. There's even a surprisingly tough RPG in the World of Light mode, and the “traditional arcade mode” continues to be a reliably fun, classic experience. 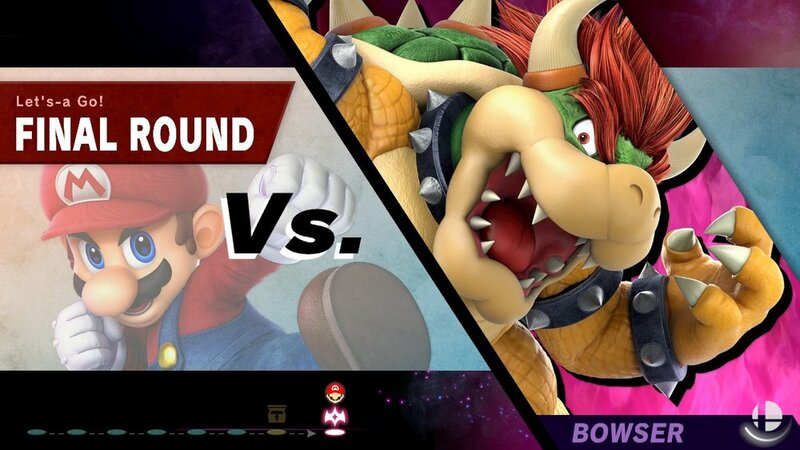 Now if you’ll excuse me: I’ve gotta unlock the rest of the cast and figure out why I would main anyone other than Bowser. Big boy season is truly upon us. Look. From the launch of the Nintendo Switch in early 2017 through December 2018, Switch systems were in incredibly tight supply in Japan. (Used systems were going for higher than list price!) Because of real supply constraints and Real Life, I wasn't able to go pick up Nintendo’s home console / handheld until June 2018. But, boy, that delay meant there were a lot of diamonds to dig up when I finally got my Switch. I've spent the most time with Super Mario Odyssey, but I also have Mario Kart 8 Deluxe and The Legend of Zelda: Breath of the Wild (which I’ve heard is quite good) ready and waiting. Even though this was a 2017 release, it was my next step after finishing Yakuza 0. I saved it for a bit—one can overdose on these games, after all—and motored through it before jumping to our #9 game of 2018, Yakuza 6. While Kiwami is an interesting remake for fans of the series, or a serviceable introduction for newbies, it’s also a bit of a weird low-point. Yakuza 0 was made using the same game engine, but it plays better and has much more content. Yakuza 6 is the first game running the built-for-PS4 Dragon Engine, and it tells a better story, and it has more interesting side content. Yakuza Kiwami suffers because of its nature: it's a remake of the original Yakuza, a game that began with a more limited scope compared to its successors. You can introduce the later games' side missions and minigames, but that doesn’t fix the constrained story at its core. Y’all need to go play this game. It’s Katamari Damacy as written by Chris Onstad and set in an accurate model of the Los Angeles that locals actually live in.